Scientists think they've found a virtual way to hunt fordark matter in the lab by studying real-world materials that may behavesimilarly to the elusive cosmic stuff. Dark matter is the name given to the mass that seems to makeup much of the universe, but remains frustratingly difficult to detect. Some theories suggest darkmatter is actually composed of tiny particles that don't interact withlight or regular matter, except through gravity. One candidate for what darkmatter might be made of is a never-before-seen particle called the axion that hasa small mass and no charge. Scientists recently discovered a surprising connectionbetween the theoretical properties of the axion and those of a newly discoveredsubset of materials called topologicalinsulators. In topological insulators, which include materials that couldbe used in computer chips, loose electrons flow easily across the surface ofthe material, but not very well through the interior. Since the same mathematics that describe topologicalinsulators also apply to axions, researchers think that by studying thesematerials they may learn more about how to find dark matter. "That both are described by the same mathematical equationis the beauty of physics," said condensed matter theorist Shoucheng Zhang ofthe Stanford Institute for Materials and Energy Science (SIMES). "Mathematicsis so powerful — it means we can study these things in topological insulators asif they were a baby universe." The research offers a new avenue in the huntfor dark matter, which has so far stymied scientists who have tried andfailed to capture the strange stuff in sensitive underground detectors andhigh-powered particle accelerators. By understanding how topological insulators work, scientistscould use that know-how to understand axions. And that,researchers said, could reveal vital clues into the fundamental nature of darkmatter in the universe. "If we 'see' an axion in a tabletop experiment, it willbe extremely illuminating," Zhang said. 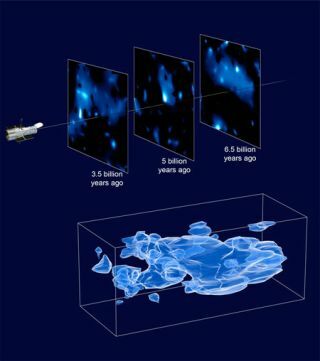 "It will help shed light onthe dark matter mystery." Zhang and colleagues Rundong Li, Jing Wang and Xiao-LiangQi, also from SIMES, which is operated jointly by Stanford University and SLACNational Accelerator Laboratory, detailed their research in the March 7 onlineedition of the journal Nature Physics. Zhang also announced his findings March15 at the American Physical Society meeting in Portland, Ore.